A Fife community council has come under fire for an internet rant against independence calling for Yes campaigners to be given “bloody noses”. 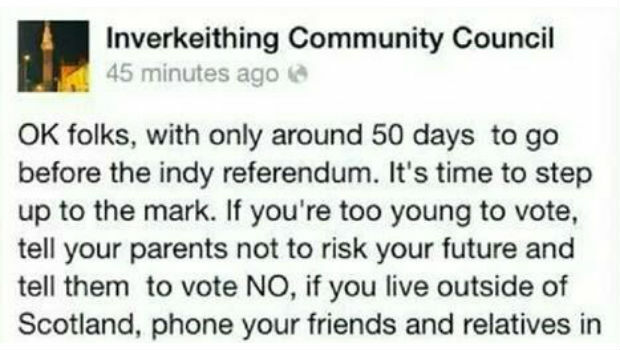 Inverkeithing Community Council’s official Facebook page last night posted a rallying call urging its followers, including those too young to vote or living outside Scotland, to persuade people to vote No in September’s referendum. The message branded Yes campaigners “separatists” and spoke of giving “Alex Salmond and his Yes cronies the bloody nose he deserves”. Angry Facebook users soon responded to what one user described as an “intemperate rant” and the post was quickly removed and an apology published. But by this time a screenshot of the offending post was being shared across social media. Calls have now been made for the person responsible to resign from the community council. Update: The Facebook page has now been removed in it’s entirety.